An emergency MTA board meeting about the L train was everything that's wrong with the MTA. There were moments at the emergency meeting of the MTA board on Tuesday when it felt like you were watching the death of an institution. The last gasps, backstabs and recriminations of an organization facing massive changes, like the Politburo circa 1988. This feeling is partially because Gov. 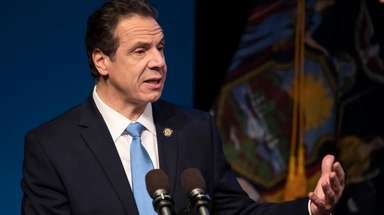 Andrew Cuomo, who controls the MTA through board appointees and hiring, has recently said the lumbering structure in charge of New York’s mass transit is uncontrollable and should be blown up. But the MTA board and management were not exactly a peaceful, happy, well-functioning crew this week. The argumentative, low-information-eliciting meeting was emblematic of the turf wars and dysfunction that have come to define the MTA. The board had gathered in the impossibly bureaucratic low-ceilinged light of 2 Broadway’s 20th floor to hear new details about the L train shutdown — or not shutdown. The fate of the L train has been in flux since Cuomo and some academic experts announced earlier this month that a long-planned shutdown to make necessary repairs might not have to happen, that the repairs could be done without a full shutdown. The board is supposed to make the final decision about all this, but that’s where the comedy begins. In his opening remarks, acting MTA chairman Fernando Ferrer said that “no formal board action” would be taken that day. So what were the board members to do? They could ask questions of the panel from Judlau Contracting and engineering firm WSP, which have been working on the L train plans. You might call this panel the capital C Consultants because they’ve been fairly monolithic since the beginning: After coming up with the original shutdown plan, they’re now the same group saying, yep, the no-shutdown sounds good too. This rankled some of the MTA board members, who said that an independent, third-party group of consultants should check on the new no-shutdown plans, and those consultants (not Consultants) should be chosen by the board, not management. One such member was Andrew Saul, who was allowed to call in to the meeting by phone because he is recovering from back surgery. This led to some indignation from Department of Transportation Commissioner Polly Trottenberg, one of the NYC board members. She said she was sure that board member and former chairman of the City Planning Commission Carl Weisbrod would have liked the honor of calling into the meeting, too. He could not be there because he, too, is recovering from back surgery and was not ambulatory. These were just two of the absences in what had been a hastily called meeting. Ferrer allowed both phone calls. The callers-in connected with some difficulty (“It’s my turn? … Can you hear me?”), yet succeeded in voicing their disapproval. Seething beneath the surface of all this are various factions and political interests. There are the usual city-state tensions between the board appointees of Mayor Bill de Blasio and Cuomo. Some on the Cuomo side of things were remarkably upbeat about Cuomo's L plans. There was the dance between expert and eternal Consultants and the politically appointed board members trying to parse the Consulting gobbledygook: “Cross-functional Work Group moving recommendations forward,” read one illustrative PowerPoint slide. There was the — it now seems — useless board meetings of the past when board members swam through pages and pages of L train slides, while a supposedly innovative and better L train solution was in the background all along. And there remain all the questions about that supposedly innovative L solution. How to avoid danger to riders and workers from hazardous silica dust unearthed by the new repair work? How much more longevity would have been achieved by closing the tunnel and doing a condensed job vs. fixing things in spurts? How long would the new L repair plan take? Will it start in April as planned? When would a board vote actually take place? None of these questions were answered definitively by Ferrer or MTA management. And yet, board members still were wondering whether the shutdown had been effectively canceled once Cuomo made his no-shutdown pronouncement. “Do we have any actual role here?” asked Trottenberg at one point.